This weekend is the opening of St. Johns+Art, a community art exhibition with the theme “inspired by St. Johns.” In honor of the event, I thought I’d write a post about pottery and community. This post is a long time coming—in my very first post I promised you I’d revisit the idea of community in a future post. I have only lived in St. Johns for a little over a year, but what has struck me most about the neighborhood is the fact that community is key. St. Johns is made up of long-time residents with a strong sense of place and new additions, like myself, who came seeking a small-town sense of ownership in their community. Inspired by St. Johns, I chose pieces for my window that reflect the importance of community. 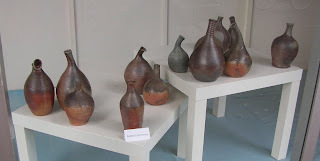 One of my pieces is titled “Pottery Community.” It is a group of bottles, arranged in clusters of two, three or four. The bottles have narrow necks that curve, and bases that lean, so they appear to be talking, watching, or reacting to each other. I used different clays for each bottle, and fired them in different areas of the kiln, so each has a unique color and surface texture. The piece (I view it as one piece made up of many parts—like a Volvox colony!) is intended to reflect the juxtaposition* of solitude and community intrinsic to the creation of art. Many of us create much of our work in solitude, but not in isolation. We are influenced by art we see and artists we meet. If we work in collective studio environments, we constantly observe and learn from the work processes of other artists. As you know, most of my work is wood fired, a process which requires collaboration between six to twenty potters to fill and fire a kiln over several days. Each piece in the kiln is affected by the pieces around it. In wood firing, the surface of each piece is decorated by the flame pattern flowing through the kiln. As the flame travels through the kiln, its path is dictated by the placement of the pots. Every pot contributes to the overall success of the firing through its interaction with the flame. Every person on the firing crew contributes to the success of the firing. Preparation of pots, wood cutting and kiln maintenance must be done before the firing begins. During the firing, the kiln must be stoked continually for 48 hours or more, with careful attention paid to the fire throughout. None of this could be done without a hard-working, vigilant firing crew. A positive community experience during the firing is also critical. At its best, a firing is a gathering of like-minded people working hard, breaking bread and sharing wine in the most beautiful of locations. As in all group situations, negativity can enter in the form of differing expectations, ambiguity of direction, and perceived imbalance of contributions. It is important for each person to treat each other person with respect, and to feel that their concerns are heard. Gossip and poor communication can cause stress. All participants recognize the importance of working together to add the final layer to our artistic creations. That spirit of community carries on after the firing and influences the work we create for future firings. We are inspired by the work of our fellow potters and driven by wanting to contribute our best work to future firings.